With a graduate degree in Food Science and a background in wine making, Carleton Yoder moved to Vermont in the late 1990s to make hard apple cider. He took a year’s detour making farmstead Vermont cheddar at Shelburne Farms, and then decided to venture into cheesemaking on his own. After a number of years in an old mill in Vergennes, where he carried countless full milk cans up countless flights of stairs, he finds himself in Middlebury making cheese that is produced by traditional recipes and methods, aided by modern technology. The texture of his Organic Triple Cream is velvety and the flavor is full of milky sweetness and it melts like butter in the mouth. It is a delightful cheese, especially in spring when fresh vegetables and herbs start to appear. 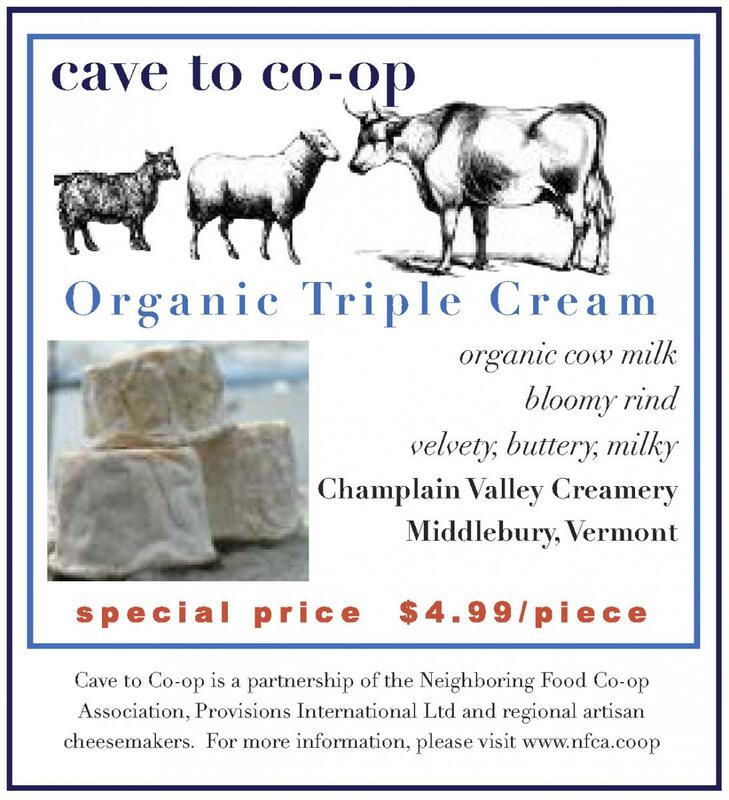 A rich Triple Cream is an easy and distinctive way to end or begin a meal. Add to omelets or frittatas, place a dollop on grilled chicken or beef and watch it slowly melt, or with a bit more effort, you can transform a triple cream into a sophisticated addition to any menu. Here are a few ideas, courtesy of Provisions International Ltd. This recipe highlights the cheese flavor with the clear taste of citrus. Mix herbs, lemon peel, salt and pepper in small bowl. Slice the Triple Cream in half horizontally and remove the top layer of each. Carefully spread the herb mixture evenly over the bottom layers, pressing gently to help it adhere. Replace the top and wrap each cheese separately in aluminum foil and let them sit out at room temperature for an hour. Pre-heat oven to 350 ºF. Place the packets of cheese on a baking sheet with rimmed sides and bake in the pre-heated oven for 15 minutes. Remove from oven and let the packets rest for 20 minutes. Unwrap carefully and transfer the cheese to a platter. Serve with crusty bread and fresh fruit. Serves 4. This is a great way to take advantage of the season’s asparagus. Pre-heat oven to 450 ºF. Mix the olive oil, herbs and seasoning in the bottom of a baking dish just big enough to hold the asparagus in one layer. Gently toss the asparagus with this mixture. Roast in the oven for 10 to 12 minutes until not quite done. Remove from oven and crumble the Triple Cream evenly on top of the asparagus, return to oven and cook until the cheese is melted. Drizzle with a bit more olive oil and serve immediately. Pre-heat oven to 450 ºF. Arrange bread slices on a baking sheet, brush lightly with some of the olive oil. Bake for 5 minutes or until golden brown and toasty. Cool. Toss radishes with remaining olive oil, lemon juice, salt and pepper. Spread each bread slice with a slice of Triple Cream, top with a layer of arugula and then a layer of radish slices. Serve. Serves 2: a delicious and unique spring dessert! Chop the rhubarb into ½ inch slices. In a small saucepan combine the rhubarb, honey, and water. With the lid on, sauté on medium heat for 5-7 minutes, or until soft. Stir occasionally to avoid burning. If it gets very dry, add a tiny bit more water. But don't add too much, you want it to be thick. Turn off the heat and stir in the tarragon. Layer thin slices of the Triple Cream on two slices of bread and top with the rhubarb mixture. Cover with remaining bread and brush oil on the outside of the sandwiches. In a medium-high grill pan or panini press, cook the sandwiches on each side for 2-3 minutes, or until nice grill marks appear and cheese oozes down the sides. Let cool slightly before cutting and serving. Serve with extra honey on the side if you wish!